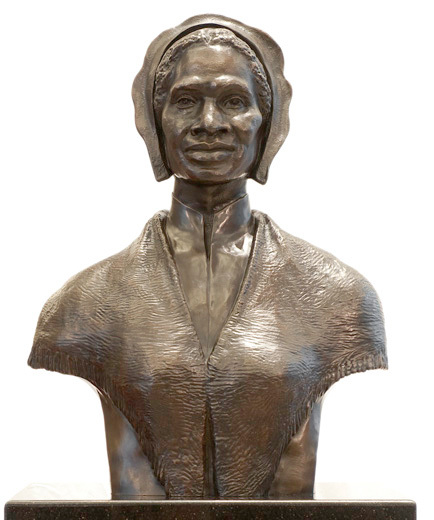 Sojourner Truth's bust is the first sculpture to honor an African American woman in the United States Capitol. The woman whom history remembers as Sojourner Truth was born Isabella Baumfree in 1797. Her parents, James and Elizabeth Baumfree, were slaves on an estate in Ulster County, New York, north of New York City. She was one of 13 children and grew up speaking Dutch. She was first sold at auction around the age of 9. In 1815 she bore her first child, a daughter, to a slave named from a neighboring farm whose owner forbade them to marry. Two years later Isabella's owner compelled her to marry one of his own slaves, with whom she had a son and three daughters. Before she was 30 Isabella had had five owners. In 1826, a year before the state of New York completed its gradual emancipation of slaves, her owner, Dumont, reneged on a promise to free her as a reward for hard work. Infuriated, she worked until she believed that she had satisfied her obligation to him and then walked away with her infant daughter. A couple named Van Wenger took them in and paid her owner $20 as compensation for her services until emancipation took effect in 1827. During her time with the Van Wengers, Isabella successfully sued for the return of her son, Peter, whom Dumont had illegally sold to an owner in Alabama. After a profound religious experience, she became a devout Christian and began to preach. She and Peter moved in 1829 to New York City, where she worked for and with two Christian evangelists over more than a decade. On June 1, 1843, Isabella changed her name to Sojourner Truth and set out to travel and preach about abolition and women's rights, telling her friends, "The Spirit calls me, and I must go." The next year she joined an abolitionist community in Massachusetts, but it dissolved in 1846, and Truth again supported herself as a housekeeper. The year 1850 was a momentous one for her: her memoirs, which she had dictated to a friend, were published as The Narrative of Sojourner Truth: A Northern Slave; she purchased a home in Northampton; and she spoke at the first National Women's Rights Convention in Worcester. That man over there says that women need to be helped into carriages, and lifted over ditches, and to have the best place everywhere. Nobody ever helps me into carriages, or over mud-puddles, or gives me any best place! And ain't I a woman? Look at me! Look at my arm! I have ploughed and planted, and gathered into barns, and no man could head me! And ain't I a woman? I could work as much and eat as much as a man—when I could get it—and bear the lash as well! And ain't I a woman? I have borne five children, and seen most all sold off to slavery, and when I cried out with my mother's grief, none but Jesus heard me! And ain't I a woman? Her renown spread during the next decade, as she spoke before abolitionist and suffragist audiences in Ohio, New York (where she met Harriet Beecher Stowe, who later wrote about Truth as "the Libyan Sibyl"), and Michigan. In 1857 she bought a house in Harmonia, Michigan, west of Battle Creek, where she settled with her daughter Elizabeth and two grandsons. During the Civil War, Truth helped recruit black troops for the Union Army, and her grandson James Caldwell enlisted. In 1864, while working for the National Freedman's Relief Association in Washington, D.C., to improve conditions for African-Americans, she met with President Abraham Lincoln. After the war she worked at the Freedman's Hospital in Washington, and she helped force the desegregation of local streetcars. Beginning in 1868, she spoke all around the East Coast for several years on the subjects of abolition and women's rights; she also unsuccessfully sought federal land grants for former slaves. She returned to Battle Creek, where she had bought a home in 1867, and spent many of her remaining years preaching and lecturing. On November 26, 1883, she died at her home, and she was buried at Oak Hill Cemetery in Battle Creek. The bronze bust of abolitionist and women's-rights advocate Sojourner Truth is the first sculpture to honor an African American woman in the United States Capitol. The over-life-size bust shows her in a cap and shawl similar to those in which she was often photographed. She is depicted with a smile suggesting confidence and determination. The texture of her hair and shawl contrast with the smooth surfaces of the face and underblouse. Acceptance of a bust of Sojourner Truth was authorized by Public Law 109–427, signed by the president on December 6, 2006. The bust was donated by the National Congress of Black Women, Inc. Having Sojourner Truth represented in the Capitol was a long-time dream of the organization's co-founder and first president, the late C. Delores Tucker. Her decades-long efforts were fulfilled under the leadership of Dr. E. Faye Williams, Esquire, National Chair of the National Congress of Black Women, Inc. The bust was unveiled on April 28, 2009, in Emancipation Hall in the Capitol Visitor Center, where it will be on permanent display as approved by the Joint Committee on the Library. Artis Lane is a California-based sculptor known for her bronze and painted portraits of famous Americans of political and cultural significance; she has also created expressive figurative sculpture representing timeless, generic men and women emerging from the ceramic mold. Lane has also created portraits of Rosa Parks and designed the Rosa Parks Congressional Medal of Honor. Born in Ontario, Canada, in 1927, she studied at the Art College in Toronto and at the Cranbrook Academy of Art and University of California in Los Angeles. She has been actively exhibiting her work and fulfilling commissions since the 1980s. In 2007, the California African American Museum mounted a retrospective exhibition of 60 years of her work.